Ten days ago, we left the farm and ventured over to New York and Baltimore to visit family and friends. Prior to departure, we did as much preparation as possible. We picked as many vegetables and fruits to eat and give to neighbors. I also took several pots of plants to the greenhouse on campus which has automatic sprinkler system. Our neighbor had offered to take care of Dusty during our absence; however, I couldn't possibly ask her to manually water all the raised beds and wine barrels full of vegetables and herbs. First honeydew melon. It's a little bigger than a golf ball now. While we were in Baltimore, I checked the weather in the Bay Area. We had another heat wave in the high 80's and low 90's! I normally take Dusty to his cage out in the shaded area when temperature gets that high. I was a little worried about him, but I knew he would be okay. He knows to find a cooler spot when it's hot. Bunnies are not as dumb as some people think. I figured some vegetables would dry out from the heat, but as long as they didn't die off completely, I could revive them upon return. We returned this afternoon, and I immediately started visiting all the edible plants. I found some asparagus with one growing like one of those "lucky bamboo" plants. It's all twisted. I found one baby honeydew melon that managed to grow to the size of a golf ball. The cocktail Asian pear tree is blooming again. It's called "cocktail" because it is grafted with 5 or 6 varieties of Asian pear. Maybe I will have a few more Asian pears this year. There is also another over grown Japanese cucumber. The bean stalk was full of green beans. Guess what we are having for dinner? Dusty hopped out from his box and hopped over to my feet. I guess that's his way of saying "welcome home." While I enjoy learning various methods of mushroom cultivation, I am much more excited about going into the woods to hunt for wild mushrooms. In 2004, I went on my first mushroom foray workshop led by David Aurora, the author of Mushrooms Demystified and All the Rain Promises and More. In the beginning, I couldn't see much in the woods. It takes some time to train your eyes to spot the mushrooms, and it takes even longer to spot the delicious ones.It is also important to network with other mushroom hunters and get on their good side for finding out those secret spots. The best way to meet other mushroom enthusiasts is to join a club or a few of them. In the Bay Area, the biggest mushroom club is MSSF (Mycological Society of San Francisco). A little north of San Francisco, there's SOMA (Sonoma County Mycological Association). South of S.F., there's Fungus Federation of Santa Cruz. Earlier this year I had my biggest harvest ever. I offered to give someone a ride to "his spot" since he didn't have a car. 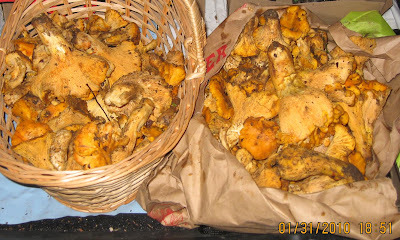 In two hours we picked over 30 pounds of golden chantrelles. We had a very good mushroom season last year with a lot of rain in the Bay Area. In addition to chantrelles, I collected plenty of Black Elfin Saddle (Helvella lacunosa) and Candy Caps (Lactarius rubidus). Black Elfin Saddle (Helvella lacunosa). I like the texture of it. It's great in Ma Po tofu. It takes on whatever flavor it's cooked in just like tofu. Every year we hear about a few families that die from eating poisonous mushrooms. Death Caps (Amanita phalloides), one of the deadliest mushrooms are all over the same places where I would find those good edibles. My rule is to stick to the ones I know well and educate myself well before eating the mushrooms I pick in the wild. People outside of my mushroom circle do not understand why I like to go out and pick wild mushrooms when they are available in the stores. I like being out in nature and fresh produce. I am also a big fan of multitasking.I used to just go out and hike until I discovered the good eats I can pick while out hiking. Most people do not like rain and stay home when it's raining. I can't wait for the rain season to start. My goal for the upcoming season is hunt for porcini. I have tasted it a few times when other hunters were generous enough to share. It tasted like butter. I never forget it. My brother and his wife are coming over tomorrow morning, and they are going to take me to an Asian hot pot restaurant for lunch. It's an all-you-can-eat, grill-any-meat and make-your-own-soup place. It's certainly not a place I would go by myself. When I was younger, I used to over eat at this type restaurant and felt totally sick afterward. My brother and his wife are both busy legal professionals. They live in a nice condo and travel whenever possible. In other words, they don't have a garden. Knowing that we will be eating a lot of grilled meat tomorrow, I wanted to put together an assortment of farm fresh produce for them to take home. I collect clear plastic containers for the purposes of gifting. I don't want to put tomatoes or figs in a bag. They can get smashed. My tomatoes are picked when they are perfectly ripe and super sweet. Oh, I almost forgot about the Mandarin oranges. They will take some of those home, too. Anyone who visits the farm shall take something home. That is the Sand Village Farm policy! I pack my own lunch for the cubicle job almost everyday. When I first started working at this company, they provided free lunch. The facility doesn't have a cafeteria. They would make 2 purchases each week for a combination of bread, packaged salad, deli meats, canned soup, frozen entrees, fresh fruits, and other packaged lunchables. I grew up eating very little pre-packaged food, so it was somewhat exciting for me. I wanted to try everything. In less than three months I had gained enough weight that I couldn't fit into the same jeans I had been wearing from college days. Then there came budget cuts and the free lunch stopped. My waistline was saved. I resumed packing my own lunch. The discontinuation of free lunch was a difficult adjustment for long time employees who never had to pay or pack lunch. I befriended Rosa, who had a hard time with the new lunch situation. Now it has been over a year, and we often do lunch share. She usually brings a meat or fish dish. I bring vegetables and fruit from the farm. We have very different cooking styles, so it is always interesting to try each other's dishes. We could easily walk down the street and buy something for lunch, but eating out isn't as much fun when you don't want to spend an hour, unpaid, for lunch. We share our food in the lunch room for 30 minutes and get to leave the cubicles earlier to enjoy life. By the way, shortly after the free lunch stopped, I was able to fit into my old jeans again. I am having an unusually good year for apples. The squirrels are constantly taking them, but I still have plenty to give away to neighbors and friends. I have sliced up at least 30 apples to make dried apple rings. Last night I decided to take an apple pie to Master Ken's Mushroom Cultivation class today, so I rolled up 2 balls of pie dough and sliced up 15 apples (they are smallish compare to commercially grown apples). Master Ken teaches on Sundays starting at 11 A.M. I got up around 8 A.M. to roll out the pie dough balls that I made last night. One ball was rolled out into a 12-inch circle and placed in my "π" plate. I piled up all the apple slices mixed with spices in there. The other dough ball was roll out flat and cut into strips for the lattice top and brushed with egg wash. It was then placed in the preheated oven of 400 degrees(F) for about 50 minutes. To prepare the pie crust, combine the flour and salt in a large mixing bowl, cut in the shortening with a butter knife or pastry cutter until the pieces are the size of small peas. Sprinkle 6 tablespoons water over the flour and gently toss with a fork. Make a well in the middle of the flour and add just enough cold water to roll the flour into a ball. Divide the dough in half and form each half into a ball. Wrap each ball in plastic wrap and refrigerate. In a large mixing bowl, toss the sliced apples with lemon juice. Combine the sugar, flour, brown sugar, cinnamon, and nutmeg. Add the apples and toss until completely coated. Set the mixture aside. On a lightly floured surface, roll out one ball into a 12-inch circle and place into a 9-inch pie plate. Transfer the apple mixture into the pastry lined pie plate. Cut the butter into small pieces and add to the apple mixture. For the top crust, roll out remaining dough, place on top, seal and flute the edge. Cut slits on top crust to allow steam to escape. Alternatively, you can make a lattice top if you have more time. To make the egg wash, crack egg in a small bowl, add a pinch of salt, whisk, and brush on top of the pie. Bake for 25 minutes and see how brown the top is. You may need to put a piece of foil on top if it is getting to brown. Tip: You might also want to put a piece of foil or foil covered baking sheet on the bottom of the oven in case your apples produce too much liquid and over flow from the pie. It's a drag to clean burnt sugary apple juice off your oven! On August 22, 2010, my last day of the summer herb class, I took a couple stalks of soapworts home. Master Ken had shown us how to make all natural herbal shampoo with soapworts. All you have to do is get a bunch of soapworts, put them in a pot, add just enough water to cover them and cook until the water turns into a soapy liquid. Squeez the cooked soapworts as much as possible to get all the liquid out and save the liquid in a bottle. That is, my friend, the most natural shampoo you can get. According to Wikipedia, "The crushed leaves or roots of S. officinalis have been used as a soap since the Renaissance. Museum conservators still use the soap made from its leaves and roots for cleaning delicate fabrics and it also makes a fine shampoo." Normally I would spend a few dollars on drug store shampoo like most people, but my best friend recently asked me about an all natural shampoo & bodywash by California Baby. This stuff is expensive! It's for sale in a 17.5 oz. bottle at $20. That's not including shipping. I am not sure just how natural it is. On its website, it states the cleansing agent is 100% Decyl polyglucose. Decyl polyglucose is a surface-active agent, and is used in soaps, cleansers and cleaning products. 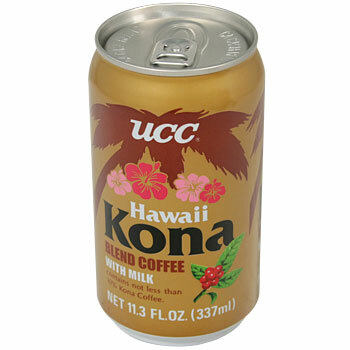 It's made of sugar (glucose) extracted from corn starch, and fatty alcohols called decanol, which comes from coconuts. That's pretty good; however, I can make my own at the cost of pennies. For the last 3 weeks, I misted the cuttings with the water bottle everyday since I don't have a sprinkler system. I am still quite new at cloning, but I was told that soapworts are easy to root and grow, so I remained hopeful. Three weeks later, I can see new leaves growing on two of them (see top picture). I decided it's time to move them to bigger pots so they can continue to grow more roots. I carefully removed all the cuttings out of the tray and discovered they all have developed roots! I divided them into two pots so they can further develop before I plant them in the ground. Figs seem to be showing up earlier than usual this year. I ate a big purple ripe one already. They are however taking longer to turn purple, it seems. The farm is surrounded by fig trees, 1 tree on each of the 3 sides of the property line. Every year I get more figs than I can eat. My dog would pick up ripe figs that fell on the ground to eat them, too. The birds would stop on the trees to eat them. Of course the squirrels love them, too. I took baskets full of figs to give away at the office. Someone happened to be visiting from Canada. He told me that his local market was selling figs for 99 cents each!!!!! I can't imagine having to pay money for figs. Last year I started to dry some figs in the oven. All you need to do is cut them in half, place them with the open side up on baking sheets, and put them in the oven with the lowest temperature setting. It takes over 10 hours or so to dry them. I wanted to preserve them for later. The problem was that they were so good that I ate all the dried figs within a couple weeks! I can't wait to make some dried figs again. One of the drinks of my choice. I keep a six pack in the fridge for those day when I am running late in the morning. I just spotted this article, My not drinking bothers friends, on CNN.com. I can certainly relate. While most of my friends who I have known for years are not bothered by it, I am constantly telling new friends that I don't drink any alcohol because they kept forgetting and wanted to pour me some mead or sake. Work celebration gatherings are a bit awkward. When they bring out the champagne for everyone to celebrate the completion of a project or software release, I have to decline and ask for water or lemonade. People often ask me, "You never drink?" or "You don't drink at all? Not even wine? in disbelief. "Why?" is often the followup question. Depending on the person and the situation. Sometimes I tell them the number one reason I don't drink alcohol. It simply tastes nasty to me. They say, oh, that's because you didn't have the good stuff. The truth is, it's the taste of alcohol that's nasty. Beer is bitter. I don't drinking bitter liquid or eating bitter vegetables. Bitter melon? No, thanks. 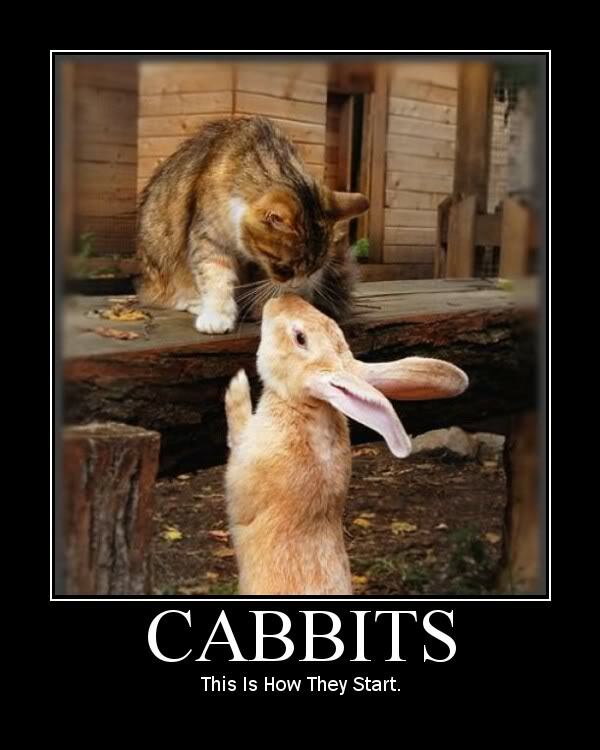 Sometimes I tell them that I am allergic to it. They will then give me the "poor you" look or tell me, "Awww, poor you." Honestly, I much prefer drinking cold whole milk instead of any alcoholic beverage. I like whole milk and and not the 2% white water. I don't like soda (pop) all that much either. It's too carbonated. I have my own line of "exotic" drinks. Sometimes I'll bring one of these bottles to a social gathering. 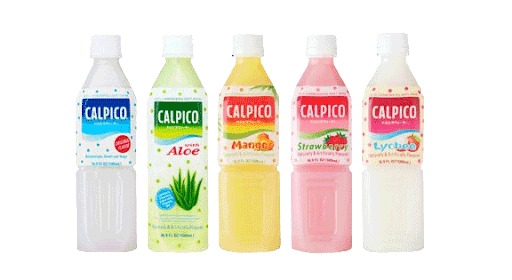 I grew up with Calpico. Back then, it only came in white, which is the original flavor. Now they have 5 flavors to choose from. Yup, the same Japanese company that sells Kirin beer also sells tea. 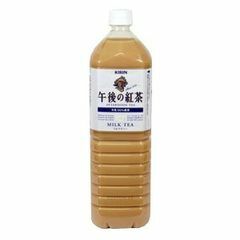 Kirin milk tea is my favorite but they also have black tea and sweetened tea without milk. Korean aloe vera drinks are awesome. I tried the unsweetened stuff from Trader Joe's once, and it was so nasty. I had to dump most of it under the peach tree. I have a huge cluster of aloe in the back of the farm. 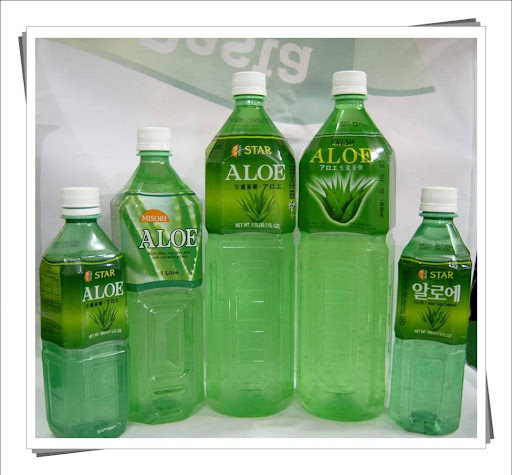 I made my own aloe drink once sweetened with honey. It was actually pretty good but very time consuming. I just discovered Korean rice drink recently in large bottles. I call this Korean horchata. I had my Mexican friend try it, and she liked it, too. The taste is different fron horchata though. Korean rice drink uses brown rice and there is no cinnamon. A couple month ago I introduced some of the flowers on the farm that just keep popping up by themselves. There are other flowers on the farm that make me really excited to see. Eggplant flower is one of them because usually fruits come after the flowers. Growing eggplants have been a challenge for me, so seeing the flowers make me feel very happy. I also noticed some garlic chives in one of my onion and potato patches recently. I was surprised because I planted 10 garlic chive seedlings earlier this year and they all died off, so I thought. Everyone told me how easy it is to grow garlic chives and how they would take over your yard so they should only be planted in a pot. I was quite disappointed when they all died off. Now I suddenly see them popping up again and flowering! That makes me really happy. This purple chive flower makes me very happy because I saved the pot of chives from being killed by nasty black aphids. Back in July it was covered with aphids, and I almost gave up on it. I was visiting my friend, Annie's urban farm, and she gave me a recipe for non-chemical homemade aphids repellent. I made it that night and sprayed the chives just once and the aphids disappeared. Now the chives are thriving again and blooming! I have been cooking international dishes for over 20 years now, but I have always shied away from cooking Indian. The spices are complex and unfamiliar to me. When I lived in the Silicon Valley, I was surrounded by awesome Indian and Pakistani restaurants. Spice Hut, an Indian fast food restaurant was less than a block away from where I lived in Sunnyvale. I had no reason to even try making Indian dishes at home. Sadly, Indian restaurants in my neighborhood are not so impressive compare to what I had before. Besides, I can't just walk a few doors down the street to get it. Luckily, I work with someone from India in the office, and she is more than happy to give me some instructions on cooking Indian and explain some of those complex spices. I told her that I love eggplants and often order Indian eggplant dishes at the restaurants. She typed up a recipe just for me so I can go shop for some Indian spices. I can find just about anything I need to cook Indian at Vik's Market in Berkeley. Whenever I feel like a quick dish that tastes like Indian food, I cook it with Panch Puran, turmeric, and cayanne pepper. For the eggplant dish, I heat up some vegetable oil and put 2 teaspoons of Panch Puran and a teaspoon of turmeric, let the spices cook in the hot oil for a minute then put bite size eggplant pieces in there. Coat the eggplants pieces with the spices then add a little water, cover it and let it cook through. You can add some onion or substitute eggplant with potatoes. I am sure you can also cook cauliflowers and other vegetables in the same way. 1. Talk with your hands. 3. Get plenty of zzz’s. 6. Go to yoga class. 9. Learn a new song. 10. Go ahead and doodle. Maybe you are one of those people who talk with your hands already, but if you aren't, number 7 has to be the most effortless thing you can do to improve your memory. You have to breath anyway, right? Who are these UK researchers? Let me Google this. Ah ha! Here's another article on "Lavender, Rosemary Scents Affect Memory". According to this article, the "The calming, sedative effect of the aroma of lavender may impair memory and attention, but the stimulating effect of rosemary may enhance certain aspects of mental function". Here's another article on "Improving Your Memory" that tells you to eat some rosemary leaves in addition to sniff them. Rosemary shortbread cookies are good for you! Not that I study much these days or need help with memory. In fact, excellent memory runs in my family, but I am going to place rosemary in my car and all over the house anyway. Remember our little honey making friends that live on the hill? On the last day of the herb class, some of us took some honey mixed with honey comb and bee parts home. Yes, sometimes the bees drown in honey unfortunately. I placed the big chunks of honey comb in a tea leaf strainer and then put the strainer over a clean glass jar. Pure raw honey dripped down from the comb. The comb turned mostly white after all the honey dripped out. After I gathered all the honey from the comb, I pour the rest of honey through the strainer to filter it. The end product is pure golden raw honey. I want to save it for special occasions. How often can you say that you have met the bees that made your honey? Japanese cucumbers can be found in Asian grocery stores. I planted a bunch of them earlier this year, but most of the young plants were consumed by pill bugs. I ended up with only one surviving plant, and I was able to harvest a few cucumbers to make the pickles. This is the kind of pickle similar to what you get in Japanese or Korean restaurants as an appetizer or garnish. You can make the pickles by cutting them into chunks or slice them thin. I decided to make a jar of thinly sliced pickles. After you are done slicing them in a non-reactive bowl, such as glass or ceramic, put some salt over the cucumber and mix them together. The salt will make the bitterness sweat out from the cucumbers. Put the sliced cucumbers mixed with salt in the fridge for at least an hour. I left mine in there for over 5 hours. When you take the bowl out, you will see liquid in there. Dump the bitter salty water out and rinse the cucumber slices with water. I sliced some lemon to put them on the side of my pickle jar before transferring the cucumber slices into the jar. You can stick the lemon slices in there later if that's easier. After all the sliced cucumbers are piled up in the jar, I fill the jar with some Japanese rice vinegar, a little sugar, salt, lemon juice, chili flakes, and water. You can adjust any of these seasonings to your taste. I like my pickles a little sweet, so I put in 1 table spoon of sugar. I put in just enough rice vinegar to fill about half way then add water to cover the cucumbers. Make sure that you leave room on top as the cucumbers may produce more liquid. After you are done assembling the pickle jar, put it back in the fridge overnight. I tried a slice of pickled cucumbers this morning. So refreshing! 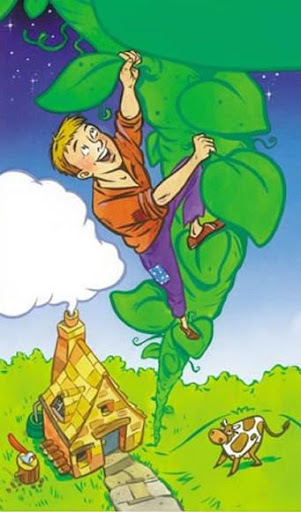 I remember reading the story as a kid and thought it was too bad that Jack has to chop off the bean stalk in order to kill the giant. Why does Jack has to kill the giant? Oh yea, he has to kill the giant because he's been stealing from the giant and he gets caught at the end! Hummm...what a strange story to tell little kids?! What is the moral of the story? That's kinda scary.